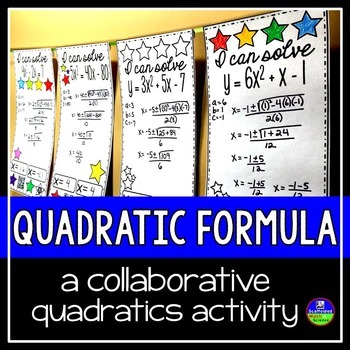 Students solve quadratics using the Quadratic Formula in this collaborative activity that doubles as classroom decor. There are 2 sets of pennants (each set has 24 pennants): 1 set with QR codes for easy checking and one set without QR codes. A traditional answer key is also included. 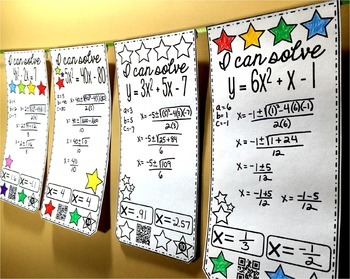 Once a pennant is complete, it can be hung along a string in your classroom to show the world that, "Hey, we know how to solve quadratics! Some of the quadratic equations are factorable, some are not. 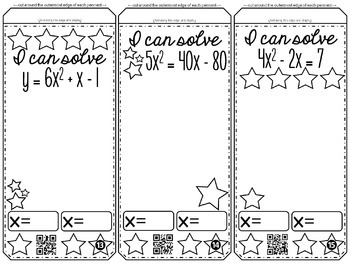 Some equations are not already solved for y so students will need to rearrange terms to correctly identify A, B and C.
Included are 24 pennants with quadratic equations to solve, an optional student answer sheet, an answer key and a title pennant. Each group of students can be given a set of pennants, scissors and either glue, tape or a stapler. Students can be in charge of cutting out the pennants. Groups can compete to see which group can complete the most pennants or your entire class can add pennants to one string as they complete each one. You may also choose to have your students color their pennants to add to your classroom decor.